This unchambered long cairn is situated in rough grazing on the SW slopes of Meikle Hard Hill between 650 and 700 Ft OD. Constructed of rounded, bare stones and rising to a maximum height of about 1.0m, it is trapezoidal in shape, just under 22m N-S by 13m transversely, excluding the extra-revetment material. A wall, now ruinous, has been built in a loop at the NW corner as a small enclosure. Excavations in 1973-5 (as yet incomplete) have revealed a facade at the wider north end, defining a concave forecourt area. Removal of the north part of the cairn to the basal layer of stones has uncovered a mortuary structure similar to that at Lochhill (NX96NE 24). Only the low stone walling is at present visible, but it appears to be rectangular, 8.0m N-S 1.25m, its north end being formed by the two central stones of the facade. Finds from here include much cremated bone, burnt wood and two burnt flint knives. At a point some 8m N of the S end of the cairn and 1m in from its W side, there is the start of a passage running E-W, dry-stone built on its S side. The N side consists of orthostats with corbelling above. The passage appears to end in a setting of four standing stones on the centre line of the cairn. Immediately S of this setting is a paved area 2.5m N-S by 1.0m E-W; its S end is marked by a standing stone and a large recumbent block. Finds include Neolithic pottery, leaf-shaped arrowheads etc. The cairn occupies a natural shelf with commanding views to the S and SW, and is now surrounded by forestry planting. The open excavation has exposed the entire cairn to its basal stone layer which measures overall 24.0m N-S by 13.0m E-W. An approximate 8.0m length of the tail has been removed and its former length is assumed from a remaining section baulk. The facade of the forecourt is clearly defined by tumbled orthostats averaging 0.8m high, the most prominent being two standing portal stones. 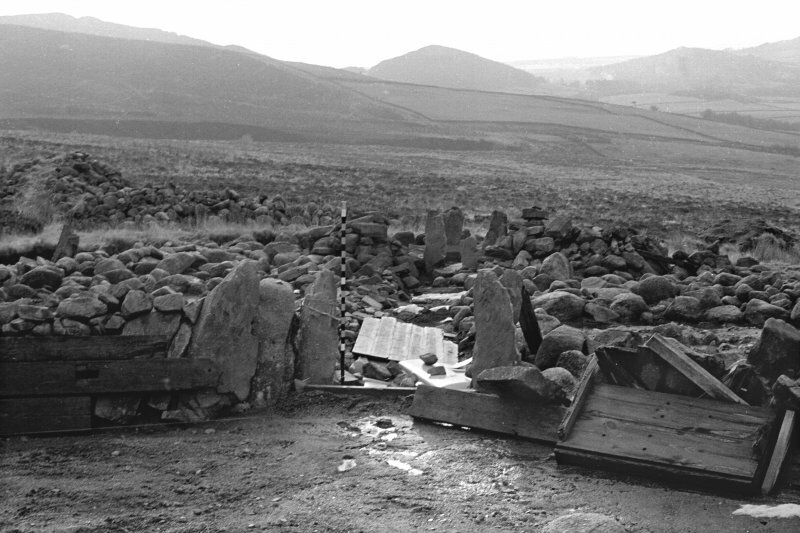 The central mortuary passage is lined by a dry stone wall and is 14.0m long with three transverse slabs, flush with the ground along its length. The connecting E-W passage (L J Masters 1975) with a blocking slab at its E end is as described. The E edge of the cairn is well-defined by tumbled dry stone walling above large basal stones, but the W edge has collapsed outwards. The open area around the cairn shows no significant features. Visited by OS (JRL) 6 February 1978.